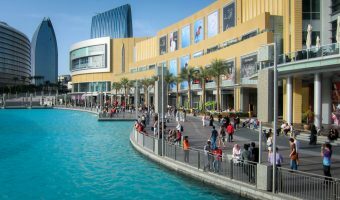 Sunset Mall is a mid-sized mall in the Jumeirah area of Dubai. It opened at the end of 2011. Shops and businesses at Sunset Mall are listed below. There are currently 26 stores here. Listings were last updated on March 1, 2019 . Amraoui Couture – Quality kaftans. Ready-to-wear or made-to-order. Big & Tall – Plus-size clothing for men. Caractere – Men’s hair salon. Challenge Chambers – Escape game. DaLina Jewellery – Unique gold and diamond jewellery. Imperial Scentury – Fragrances for women and men. Roots Salon – Women’s hair and beauty salon. The Closet – Designer handbags and accessories (Hermes, Chanel, Prada, Goyard, Christian Dior etc.). Restaurants, cafes, and other places to eat and drink at Sunset Mall are listed below. Beesket – Create your own juices using combinations of fruits and vegetables. Pappa Roti – Coated buns. Sesame – Restaurant offering healthy dishes from around the world. Sunset Mall is situated on Jumeirah Beach Road. There is plenty of free parking in the basement. There are no Metro station within easy walking distance of the mall. The closest are Noor Bank and Business Bay. Both are several miles from the mall. Map showing location of Sunset Mall.